Wind, weather, spring and food ! I was talking to someone about the wind, and she was saying that her small son really doesn’t like it. I remember as a small child being frightened of the wind (my baby-sitter had threatened me with it on a number of occasions). My father came up to say goodnight and found me sobbing in the bed, and gradually got me to tell him what the problem was. After that every time there was a strong wind, he would come and sit on my bed and tell me stories that the wind was bringing – how a south wind brought tales from the south seas, an east wind told of the legends from the middle and far east, a north wind brought stories of polar bears and myths of the ice cities while a west wind brought stirring sagas from the great plains of America. My fear was calmed, my geography – and my sense of direction improved and I learned to love the sound and ferocity of a storm. Oh – and funnily enough a new baby-sitter was found! Up here on Orkney today, though my daffodils are out, the crocuses are blooming away and the rosa rugosa is showing leaf. The most noticeable changes though are with the bird life – everything is moving !! The oyster catchers are busy catching oysters – well not really, more like flying around shouting and then having a dig in the mud for whatever goodies they can find. Skeins of geese are flying around making a hell of a racket as they try and make up their minds to head North to their breeding grounds. “Our” hen harrier is hunting up and down the burn. The heron is making his presence felt at the end of the loch, and there are so many different ducks appearing and bobbing around. I heard today that a pied wagtail has been seen, so I am hoping that the pair that has been around for the past two years will reappear soon. We love it. It does interrupt the work a bit on occasion as one of us exclaims at the latest flypast or the amazing light on the loch. Some days it is grey (not often), others a greeny colour, but then it turns bright blue followed by almost black as the sun’s rays pass across. I am told that ponds in Orkney are teeming with breeding frogs and frogspawn is on offer if wanted. We did try putting some in the slower running parts of the burn last year. However, Mark fell in as he scrambled down to put it somewhere where we felt it might survive and has said rude things if I suggest trying again, especially as the next day a storm put paid to the quiet area and we think it all got washed out into the loch. Maybe the resulting frogs are what the heron is so interested in. 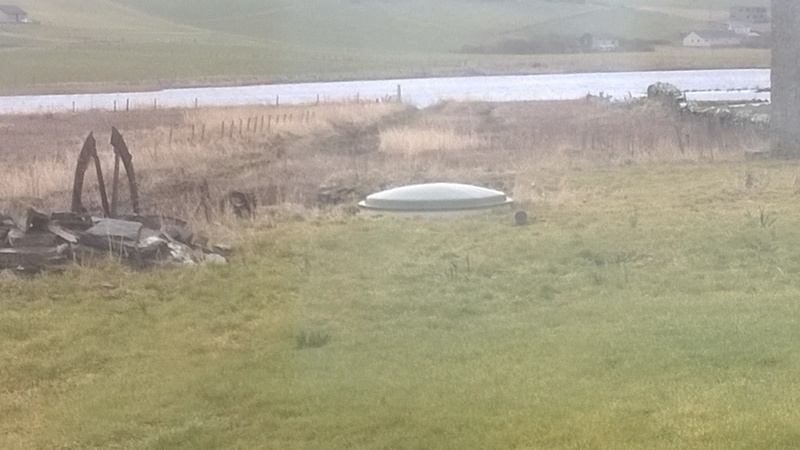 Digressing slightly, we have a “Kargester” which is a large green dome in the garden that does unmentionable things as part of our drainage … allegedly the water that comes out the other side is drinkable but it would take a braver person than either of us to try it. It replaces the old (very old) stone walled cess pit to which the original drains ran and all too often, didn’t. And which got filled in when we had the builders here with the big digger. Anyway, SEPA (Scottish Environmental Protection Agency) decreed that this alone was insufficient as the end product is going into the burn which in turn goes into the loch which is a site of Special Scientific Interest. So … they insisted that the water out of the Kargester goes into not one but two reed beds. Filled with EU approved reeds rather than native ones. However, they seem to be surviving. Just. And it occurs to me that we could put some frogspawn in the reed beds. Maybe. Or maybe not. At the risk of offending my vegetarian daughter and other veggie friends, we were fortunate enough to be offered a lamb the other day – an Icelandic/North Ronaldsay cross. This is a small breed, and he was young (his name was Bjorn). He resides in my freezer now and I have to say that the racks we ate the other night were delicious. Lots of flavour but not too “lamby” if you know what I mean. Hoping that some friends will come and share a leg before too long !! On the subject of lamb, I went to Craigies at the Brig a couple of weeks ago and got a boned shoulder which got made into a Rogan Josh courtesy of Rick Stein’s book on India. It was really good as can be seen from the empty plates in the picture ! 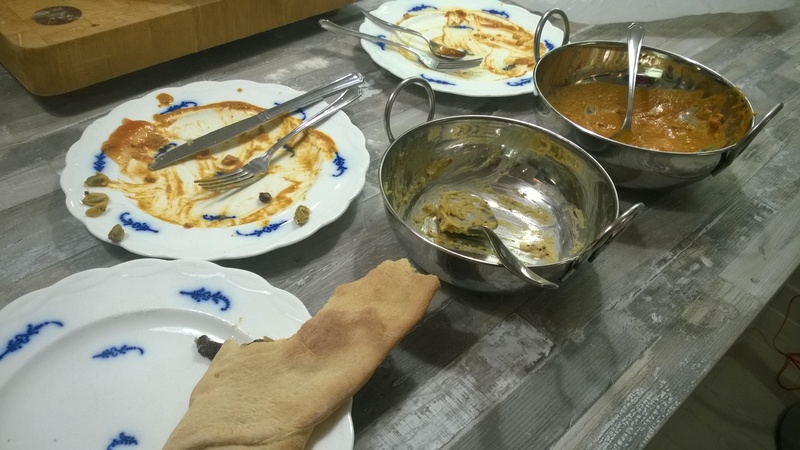 Channa Dhal and home-made Naan bread completed the evening and left us truly replete. There’s lots of lovely fish around at the moment, and I have been happily trying some new fish recipes – plaice was the latest effort, done with home-made five-spice and very good it was too. Keen to try this recipe as well : http://www.orkneycrab.co.uk/files/Asian_Style_Crab_Salad.pdf sometime soon it sounds delicious. Or maybe Thai Crab Cakes. Or something. 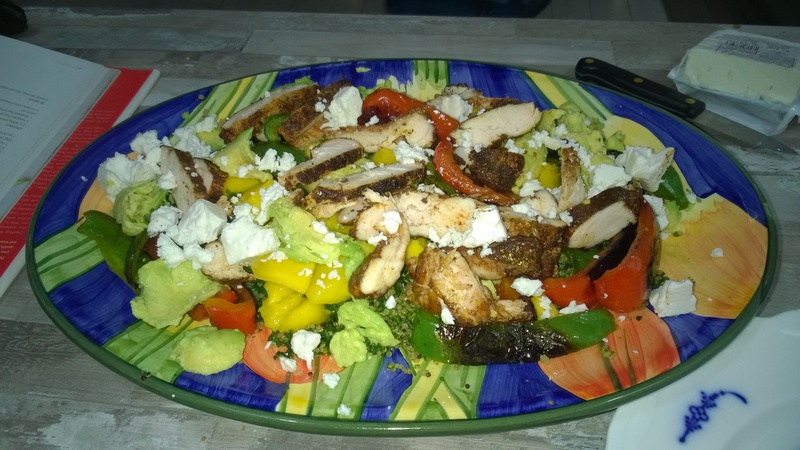 Mark is taking his turn in the kitchen as well and finding new recipes – like the very colourful spiced chicken with a feta cheese salad. I am busy putting all my recipes on One Note – that way if I see something in the shops that I fancy cooking I can check online that I have the other necessary ingredients for the recipe I have in mind. 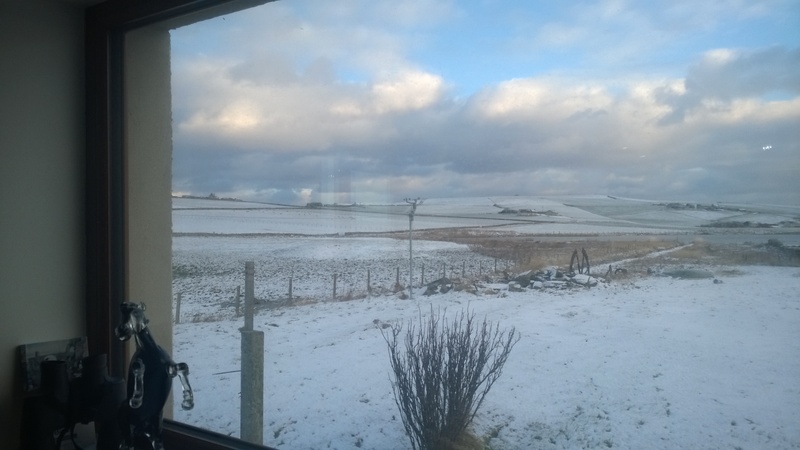 Given, of course that we can get an internet connection, not always possible here on Orkney as some of you will be aware. But now it’s time to stop wittering on and go and feed the cats (they are wittering big time) and as it is Friday it is Beer O’Clock so we will be heading down to the Flattie Bar ere long. Poor Mark has missed out on that for ages as I had a nasty fall on a muddy walk at Birsay and **** up my leg and ankle somewhat so haven’t dared drive. But it is now sufficiently recovered and I am only limping occasionally so … I am in a fit state to drive him home. Hurrah!